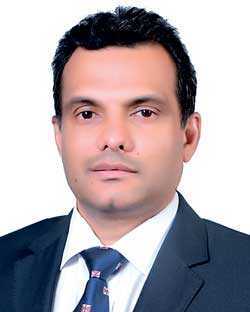 Nanayakkara Hettiarachichige Gihan Sudharshana Jayasinghe has been appointed as Managing Director of Hapugastenne Plantations PLC (HPPLC) and Udapussellawa Plantations PLC (UPPLC) with effect from 3 September. HPPLC and UPPLC are the plantation sector subsidiaries of the Finlays Group. Jayasinghe has served on the Boards of HPPLC and UPPLC since April 2017. He has now been appointed Deputy Chairman of Finlays Colombo Limited, and will take over from H. A. S. Crawford as Finlays Sri Lanka Country Head with effect from 1 January 2019. He is also the Group Director of Finlays Colombo Limited, overseeing the Company’s Value Added Tea - processing, logistics & export operations. Jayasinghe joined Finlays in February 2006, as the Chief Executive Officer of Finlay Cold Storage Ltd., and was appointed Director of that subsidiary in February 2008. He was appointed an Executive Director of Finlays Colombo Limited in November 2014, and subsequently as Managing Director in May 2018. He has an educational background in Engineering and Business Administration and is an Alumnus of INSEAD. He is a fellow of the Chartered Management Institute, UK (FCMI) and a Chartered Member of the Chartered Institute of Logistics and Transport, UK (CMILT). He has served as an Executive Committee/Council Member in the Sri Lanka branch of these institutes in various capacities, the Ceylon Chamber of Commerce sector steering committee, and currently serves as a Vice Chairman of CILT Sri Lanka. He is also a Council Member of the Employers’ Federation of Ceylon representing the Manufacturing Sector – Export Group. Prior to joining Finlays, he held senior management positions in the services and logistics sectors. He has experience in diverse fields in sales, manufacturing, construction, engineering and transport & logistics. The Board of HPPLC and UPPLC, as now constituted is Messrs. N. K. H. Ratwatte (Non-Executive Chairman), N. H. G. S. Jayasinghe (Managing Director), M. C. Pietersz (Executive Director), D. J. Ratwatte (Executive Director), H. A. S. Crawford (Non-Executive Director), G. Dassanayake (Independent Non-Executive Director), E. D. P. Soosapillai (Independent Non-Executive Director), G. R. Chambers (Non-Executive Director) and J. M. Rutherford (Non-Executive Director).